Cables help open a new dimension of backplane design for data center and 5G infrastructure. Last month I wrote about our 56G SerDes announcement – silicon validated and running in Rome at a major show. We had a great time at that show and got a lot of compliments about the quality and flexibility of our SerDes. These kinds of unfiltered, unsolicited customer comments are really what makes it all worthwhile. It was a gratifying and exciting time. This month, we’re at it again. Our second test chip is back, and more good news all around. We’re beating our specs during bench testing. We also announced today that our 7nm 56G long-reach SerDes is available for licensing. You can read about that at the link provided. What has been quite interesting about this journey is the friends we’ve made along the way. Last month, I provided a profile of Anritsu, a very well-established company in the communications test and measurement space. Along with our announcement of SerDes availability, we’ll be demonstrating our device again, this time at the SuperCompute show in Dallas on November 12-15. Like the show in Rome, we’ll be in a partner booth. This time, it’s Samtec, also a well-established company of about 5,900 employees that supplies cables and connectors to more than 23,000 customers worldwide. Wow, I sure wish there were 23,000 customers buying FinFET ASICs. While our product marketing folks knew Samtec well, I got to know the company over the past few weeks. If you’d like to be the technology elite snob, you could dismiss cables and connectors as a low tech, largely solved problem. That would be a mistake. Companies like eSilicon can deliver sophisticated SerDes technology to serialize data, transmit it and then re-assemble it at the other end. How the data gets from point A to point B is just as important and challenging as generating the data in the first place, however. Samtec has an extensive line of cables and connectors that accomplish the signal transport piece with amazing accuracy and stability. The material science, manufacturing accuracy and required physical robustness of these products were truly humbling to learn about. Delivering a physical medium with skew less than 3.5 ps/meter over extended length is NOT easy, but Samtec does it all the time. Thanks to Samtec’s innovation, we’ll be taking “long-reach SerDes” to a new limit at the SuperCompute show in Dallas. 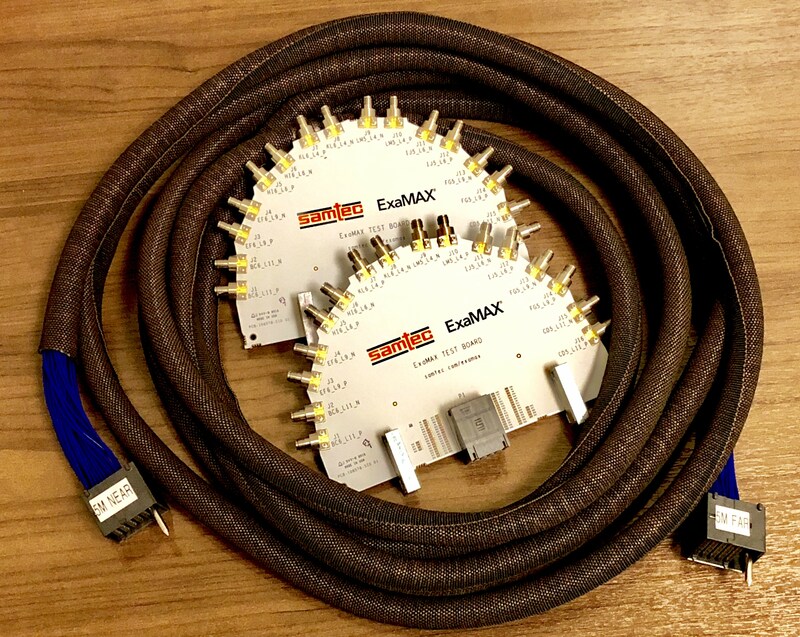 Samtec’s Ralph Page said it best in our press release: “eSilicon’s true long-reach DSP-based SerDes coupled with Samtec’s low-loss Twinax Flyover Cable Assembly enables reach beyond the rack; five meters and beyond for data centers and 5G wireless infrastructure.” That’s not a misprint, we will be running a 56G SerDes over a five-meter cable at SuperCompute in the Samtec booth (#521). I love the ‘reach beyond the rack’ tagline. This technology opens up a new dimension of backplane design for data center and 5G infrastructure designers. For the geeks out there, the demo will show error-free operation in 56G PAM4 operation over a 30dB channel without forward error correction (FEC). No circuits along the way to fix errors, just our SerDes and five meters of copper cable. Well, a rather sophisticated five meters of copper cable. We are honored to have the only cable this long in the world (at present). Needless to say, we keep it locked up. We’re excited to be setting a new bar in what long reach means. If you’re planning to attend SuperCompute please stop by the Samtec booth. You can also sign up for a more in-depth presentation at the show once a confidentiality agreement is signed, or even after the show. Hope to see you there. Mike Gianfagna is the vice president of marketing at eSilicon Corp.